We’re all nerds about something. Yes? What sets you on fire? For me, it’s writing and astronomy. Six years ago, we moved to a new town. 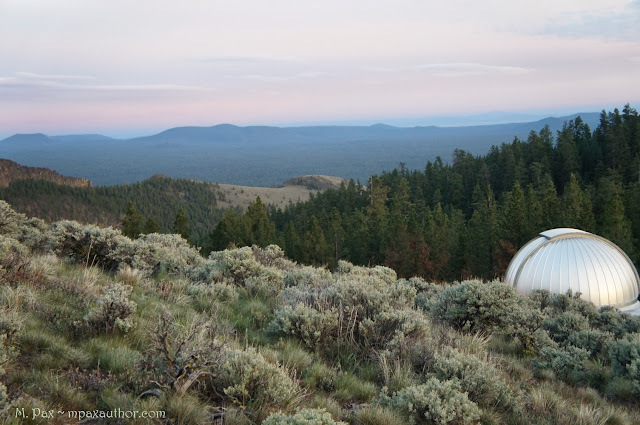 Seeking a way to become connected with my new community, I found an ad for volunteers at the local observatory on Meetup.com. There was nothing I wanted to do more. The problem? I didn’t know much about the sky. I knew the Big Dipper, how to find the North Star, and Orion. Since star guiding takes place in the summer and Orion is a winter constellation, that did me no good. I wanted to learn. I wanted to look through telescopes. I wanted to get to know the constellations and the wonders they housed. So I took a deep breath, put on a brave face, and went to the meeting. Little did I know at the time, that I’d spend the next six summers conducting star tours of the night sky, that I’d become as skilled at navigating the constellations with a set of star charts as a seasoned veteran. Well, now I am a seasoned veteran. I keep trying to photograph what I see. Photos do not capture the wonder and sparkle. 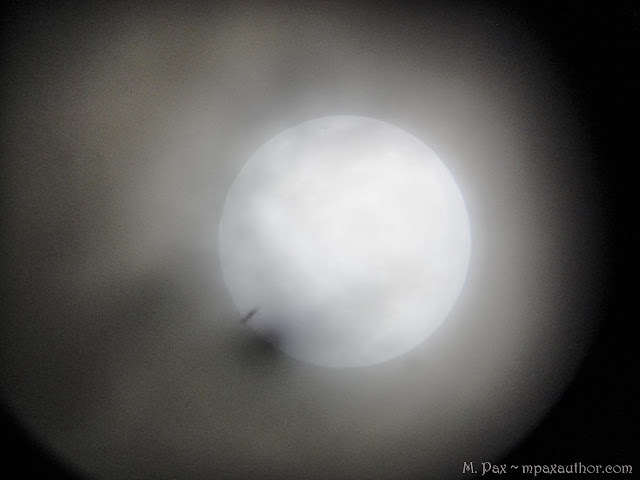 They don’t catch what’s in my eyepiece. There’s very little color. Why? Our eyes need a lot of light to see color. I may not be the most knowledgeable star guide, but I’m at the top of the heap with enthusiasm and passion. 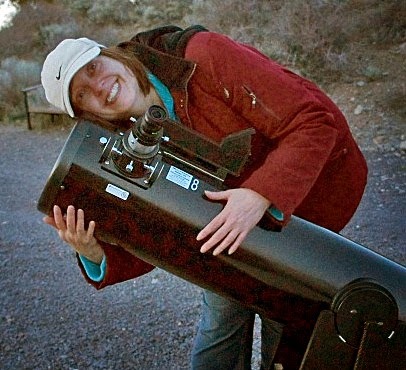 I love what I do, and I’ll let you know I love it when chatting out beneath the night sky. It fills me up with sparkles, makes my heart smile and spirit soar. What’s out there? 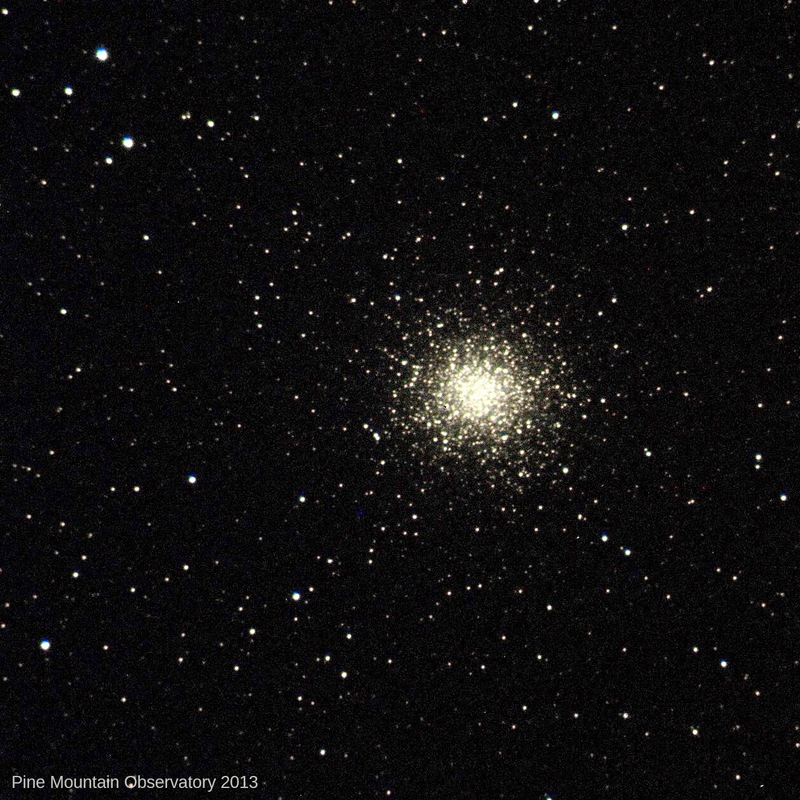 I can’t say for sure, but I’ll continue discovering the night sky’s wonders. It’s a thrill that doesn’t get old. Just released! Book 4 in the Backworlds series! What gets your geek going? Two weeks and a few days before the Realms Faire begins, and what an event it's going to be. Samantha Geary informs me she's working on a super secret project involving her flash fiction event for the Faire. Ooo! Super secret is super exciting. Sheriff Gwen has arrested five suspects on charges of word wizardry. They're already in the stockades. Do you know who they are? 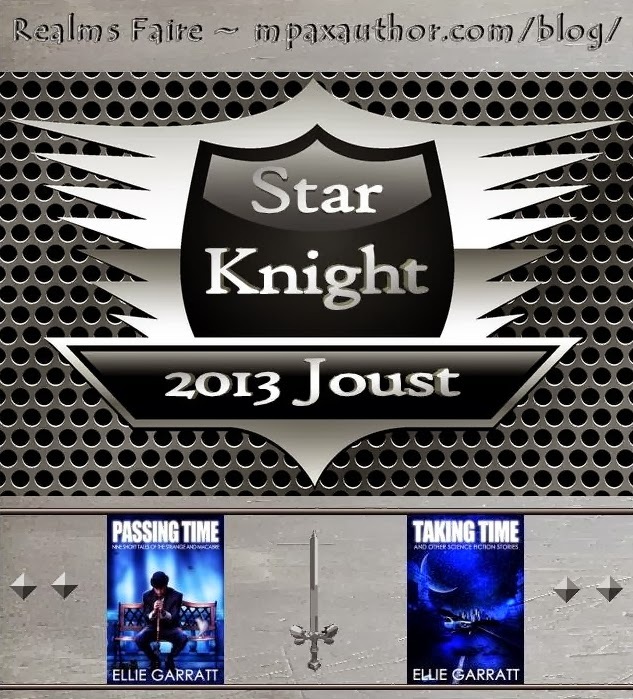 The ten knights are polishing up their armor for the joust. Here's a peek at a few of them. Are you ready to rumble and huzzah? So can I hear a few huzzahs? Story ideas don't always like to fit neatly into one book, two books, or even five books. My world of Amora is like that. One day Yssa, the sixth Phoenix Prophetess, stepped out and started telling me her story. To save a kingdom, she must challenge Fate. Bit by bit, the story came to me. I had the story idea for Reborn in 2006, but I didn't start writing that novel until January 2009. By September 2009 (nine months, how fitting! ), the first draft of Reborn was complete and my debut novel will be out in May 2014. But Reborn isn't just one book. Yssa's transformation will take three total books: Reborn, Reforged, and Redestined. All right. I can handle that and am even writing book two's Reforged now. As I was thinking of the last chapter in Redestined, Yssa asked Apenth (God of Prophecy) a question: Am I the last Phoenix Prophetess? He started to say no, but then Yssa--um, I mean me--had a vision of a dark-haired girl with electric blue eyes. This sixteen year old is all hard edges, but with a softness she tries desperately to hide. Her name is Kalliope, but she prefers to be called Phoenix. She's the seventh and last Phoenix Prophetess and in the next year or two, I hope to begin her story. Of course, she's not the only one telling this story. Apenth just had to have his say too. Kalli will have book one. Apenth will take over in book two, and they will share book three. Okay. One world, six books. I'm done, right? Um, not exactly. A princess stepped out from the pages. At one point, Magna opens a school of sorcery for the kingdom's Royals, but she showed me a scene of how she fought to save her kingdom against Fate and the people of Apentha. But I thought Apentha was a city within the Kingdom of Amora. She told me how they used to be unified, but then they split in two. She's working to unify them again. 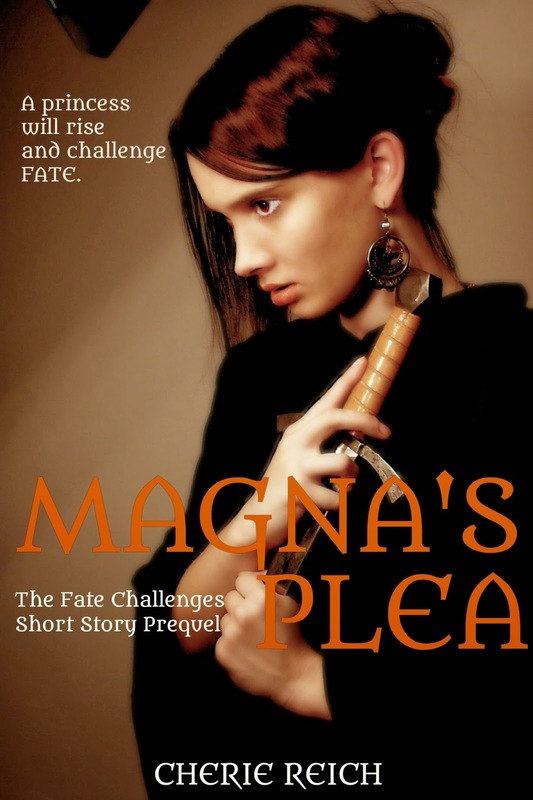 This idea was thankfully just a short story titled Magna's Plea, which is now available for free at Amazon / Nook / iTunes / Kobo / Smashwords / Goodreads and you read online it online at Wattpad. 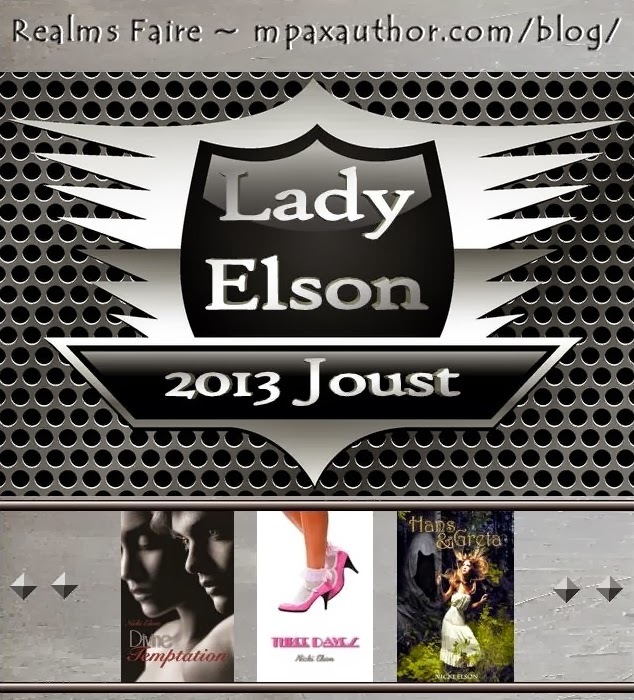 One world, six books, and a short story. Done? Not exactly. Recently another Phoenix Prophetess and princess have caught my attention. I thought the story would be from the Phoenix Prophetess's point of view, but instead it's from the princess's. Reza won't let me not tell her story how she is challenged by Fate, betrayed by love, imprisoned by chaos and how she must break free and reign in Reigned. So one world, seven books, and a short story. We'll have to wait and see what comes next. Have you created a world and keep finding ways to come back to it? 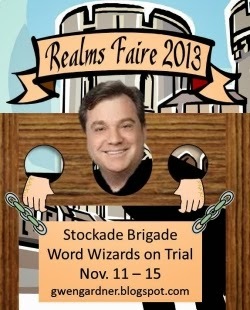 Only three weeks until the 2013 Realms Faire! Get excited! There'll be 9 events giving away prizes daily. Many will have grand prizes at the end of the week and this site will have an ultimate grand prize. Oooo! 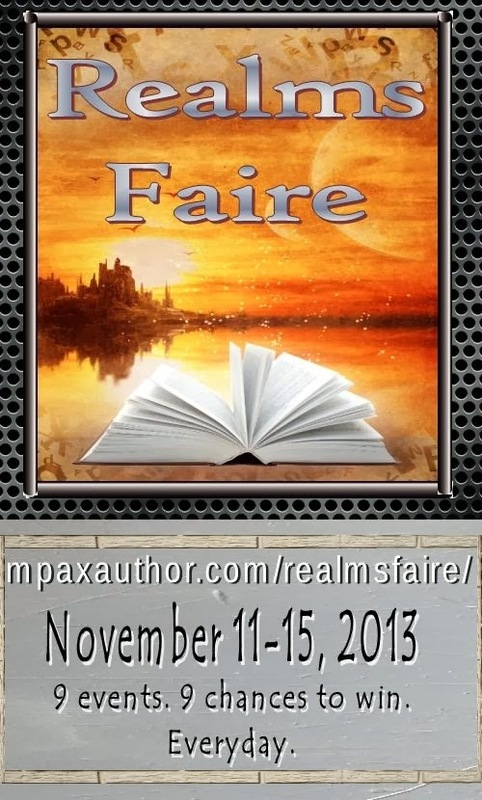 Since the Faire isn't just about the Renaissance anymore, the badges have been updated. Snazzy, huh? All of the events with sign ups have been filled. But the fun has yet to begin. 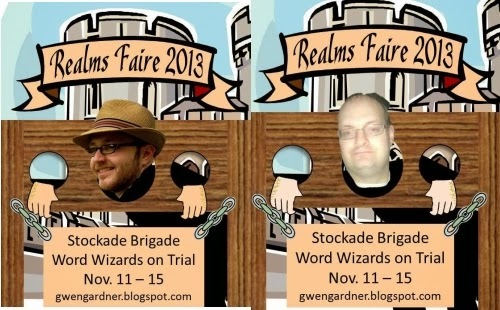 Grogz on Facebook is now open to meet other Faire goers and to hear the knights talk smack. 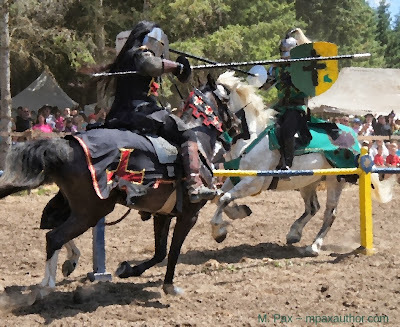 So what kind of events can you partake in during the Faire? Christine Rains is hosting Soak-a-Bloke/Drench-a-Wench in which selected targets are pummeled with comments. She'll be holding daily drawings for those who participate and a grand prize at the end of the week. You must play to win. Cas Webb is hosting Dueling Bards. Two writers go head to head in nail-biting contests. The outcome is decided by you. Winners selected daily from comments. River Fairchild is conducting a Dragon Hunt. Can you find them all? 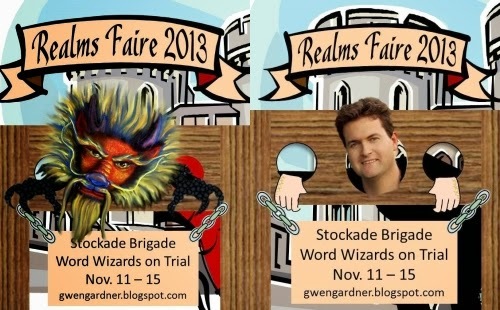 For more information on these events and all others, see the Realms Faire page. 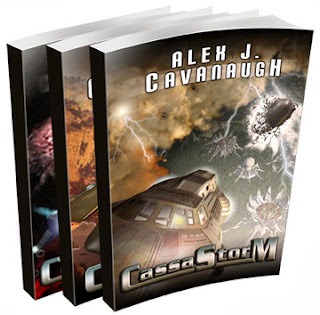 When I first wrote CassaStar, I had no intensions of writing any other stories about Byron. The story stood on its own and Byron had evolved during the journey. But fans wanted more and I had to take the character beyond that point. If you’ve ever written a series, then you know it’s a daunting task. Especially when you are following just one key character. How do you show growth? How do you reach a satisfying conclusion? We all go through stages. The person we are now is not the same as the person we were twenty years ago. Situations change and new people enter our lives. Those things impact us, molding us into different people. (And we hope better!) Our characters need to grow in a similar fashion. 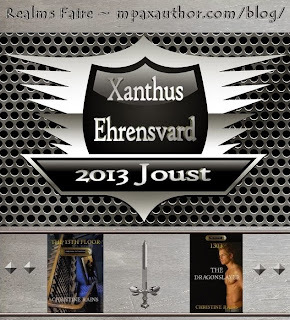 In my second book, CassaFire, I jumped ahead twenty years. Byron wasn’t the same rebellious young man that we saw in the first book. I showed his growth in maturity through a promotion in rank and a calmer, more professional demeanor. I also threw situations at him he’d not experienced, most of which revolved around a female pilot. Byron couldn’t remain in his secluded and private life any longer. He had to let go of past hurts and admit he needed more. He also had to face a personal demon and rise above the challenge. The introduction of someone new in our lives always requires adjustment. So do new vocations. There are a lot of factors that can show a character moving forward, willing or not. Even as they change though, baggage still follows. And that gives us the opportunity to bring a character full circle. In the final book, CassaStorm, I jumped ahead another twenty years. Byron isn’t just a pilot now – he’s the commander of the Cassan base on the planet of Tgren. He’s also the father of a ten year old boy who is experiencing nightmares. And he’s in the middle of a crisis that could destroy the ten known races. All of those things force Byron to grow. But I went beyond that and tied in several factors from the preceding books. The force threatening to destroy them all originated in CassaFire. The solution ties in with a situation originating in CassaStar. There are many demons lurking this time. And ultimately, Byron becomes much like his mentor in the first book, not just in age but in wisdom. And he has to be willing to make the same sacrifice. It’s not easy tying up a series with a neat bow. Even if your characters aren’t taking huge leaps in time like mine, you can still move them forward and bring them to a satisfying conclusion. Just remember the ripple effect, and how one incident can cause a chain reaction. Look for those incidents in your first tale. And then bring your characters full circle. Trying to stand out among the throngs isn’t an easy job, is it? No. That’s why I created the online joust last year. I wanted something different and unusual and fun. It certainly brought attention to me and my newly released book, The Renaissance of Hetty Locklear. That was all well and good. The fun and camaraderie led to comments like, “You should do this every year.” Hmm, I thought. That event also led to the creation of Untethered Realms. Several of the folks stayed long after the fun, chatting. One thing led to another. And, here we are. 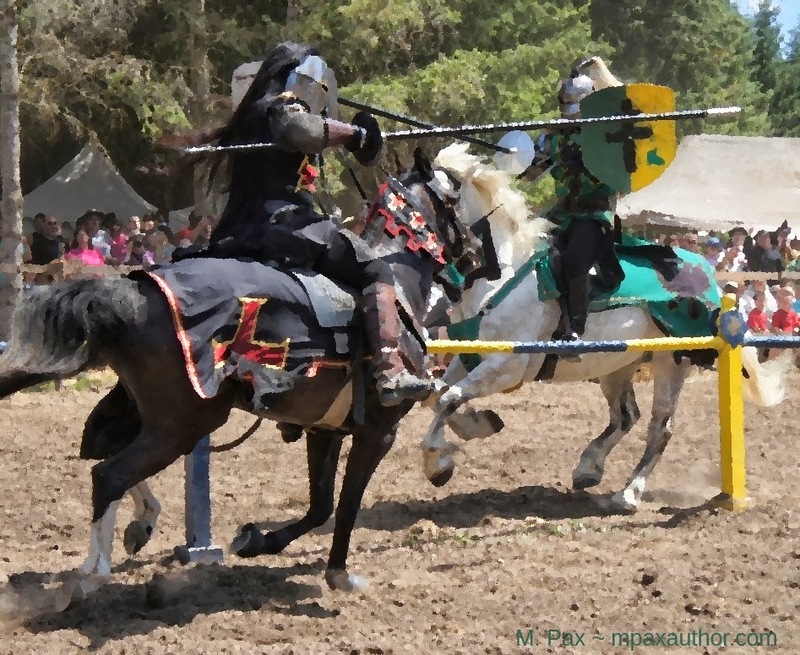 The joust has been expanded into the Realms Faire. It’s meant to encompass all speculative fiction, even though so far it’s mostly medieval based. There will be nine events hosted on nine different sites [including this one] with chances to win prizes every day. Yes, every single day, nine times over, you could win a prize. There will be the joust, a masquerade ball, the book witchery trials, a dragon hunt, castle jumble, soak a bloke/drench a wench, phasers, and an event using writer’s excerpts and secret/magic words. 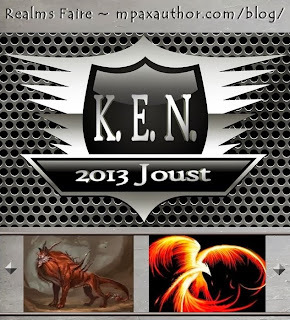 UR will be offering a Kindle as a grand prize and a mega ebook bundle. It’ll be a grand opportunity to have some fun. It’s a grand opportunity to get yourself and your book or site some notice in a week long event aimed at bringing in readers and fun seekers. Want to get involved? Sign ups are HERE for specific events and sponsors. 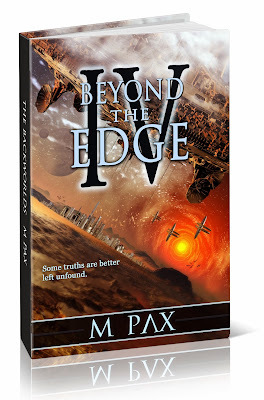 Or you can email me at mpaxauthor at gmail dot com. Our gracious hosts for this event: Cas Webb [thank you a ton for stepping up], Christine Rains, Laura Eno, Angela Brown, Gwen Gardner, Samantha Geary, River Fairchild, M. Pax, and Untethered Realms. A big thank you to Catherine Stine for putting together the grand prize packages. I hope you'll join us for a lot of fun the week of November 11th. Social media is both a writer's tool and a hindrance. We use Twitter, Facebook, Google+, and many others forms to communicate with our readers and fellow writers. But it comes with a price - time. If you're not careful, hours can be lost reading status feeds and twitter streams. For these very reasons, I resisted joining Pinterest until a couple of weeks ago. Boy am I glad I finally did join, and let me share with you why I feel that way. Pinterest is quick and easy to set up. A picture and couple of lines for a bio, and you're away. There are no status updates, friends requests, messages, game requests you have no interest in, adverts, or a host of other time-sucking activities associated with some other forms of social media. You simply set up 'boards' (secret or public) that you pin inspirational pictures to. You can find these pictures by searching Pinterest, following other people or boards, or pinning from the web. There's a handy Pin option you can download to your toolbar. Boards can be created to inspire a particular project you're working, form a working storyboard, or give your readers a visual teaser of the stories you have or are creating. For me, the most important thing about Pinterest is being able to visualize the world I'm creating through art. It provides me with a much needed shot of inspiration without draining to much of my time. Here's the board I've started, with little effort, for the science fiction series I'm writing. So, have you discovered Pinterest yet? Have I tempted you to take a look? The Vanished Knight out now. 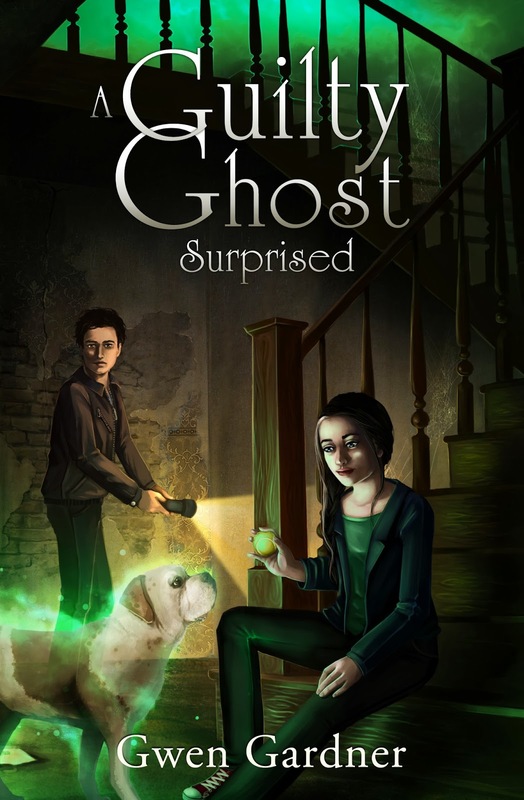 Gwen Gardner, author of Givin' Up the Ghost is releasing the much anticipated sequel, A Guilty Ghost Surprised. Angela Brown, author of Neverlove, is releasing a hot novella follow up, They All Fall Down. Together, they are also known as the Ladies of Partners in ParanormYA. 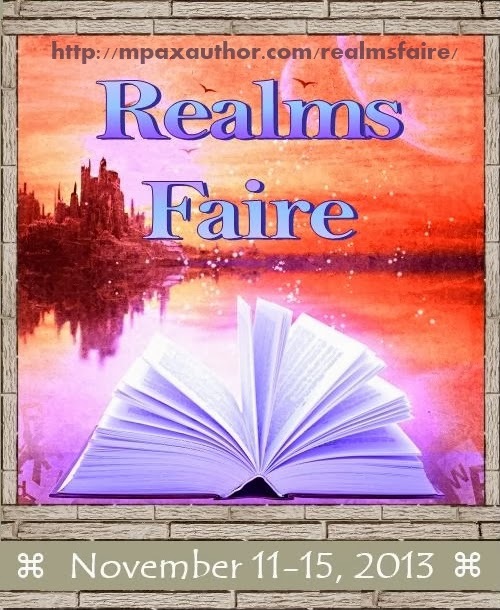 And as members of Untethered Realms, we're thrilled to share in the ParanormYA-palooza! 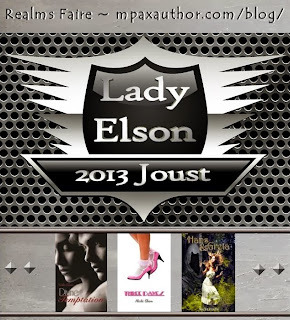 They're traveling the blogosphere on a Book Blitz Tour that you can follow by checking out their stops for the day here. 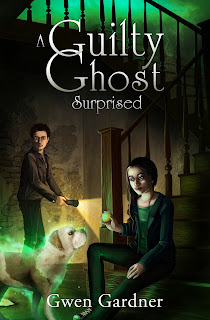 About A Guilty Ghost Surprised: Indigo Eady and gang are back with a feather and a Chance setting off another twisting-turning investigation to bring a cold case, and loved ones, closure at last. About They All Fall Down: Free of their duties as Cleanser and Harvestor, Abby and Basil try to move on with their lives. But some secrets remain. And what is done in the dark won’t be good when it comes to light.